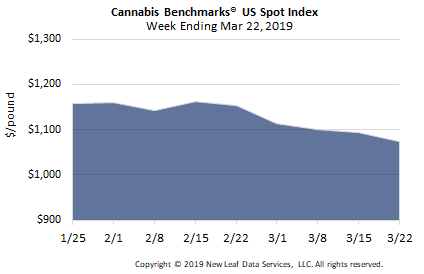 U.S. Cannabis Spot Index down 1.7% to $1,074 per pound. The simple average (non-volume weighted) price decreased $43 to $1,112 per pound, with 68% of transactions (one standard deviation) in the $392 to $1,831 per pound range. The average reported deal size was nominally unchanged at 2.8 pounds. In grams, the Spot price was $2.37 and the simple average price was $2.45. The relative frequency of trades for indoor flower decreased week-over-week by 3%. The relative frequency of transactions involving greenhouse and outdoor product increased by 1% and 2%, respectively. Outdoor flower’s share of the total reported weight moved nationwide increased by 2% compared to last week. 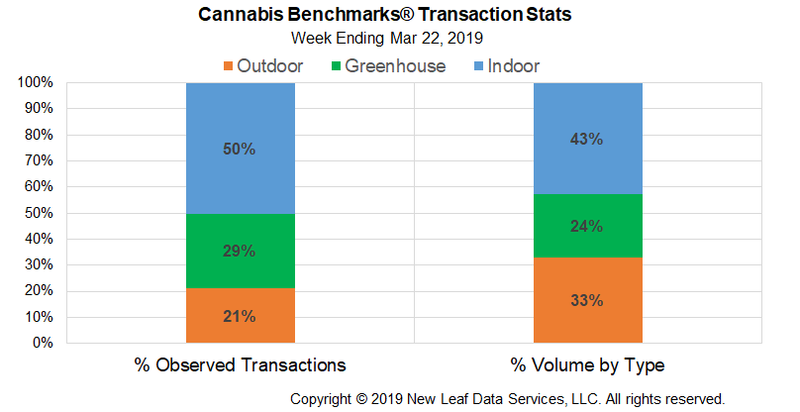 The relative volume of warehouse-grown product decreased by the same magnitude, while that for greenhouse flower was stable week-over-week at just under a quarter of all documented weight moved nationally. The U.S. Spot Index ticked downward for the fifth consecutive week, by 1.7%, to settle at $1,074 per pound. This week is the third consecutive one in which the national composite price has fallen to establish a new year-to-date low. As we have pointed out previously, the behavior of the U.S. Spot in recent weeks has diverged from the upward momentum observed at this point in the year in both 2017 and 2018. 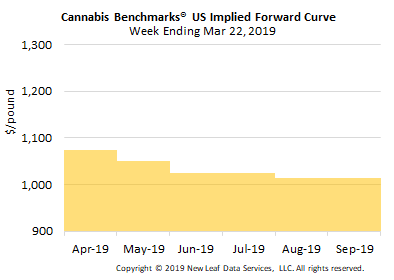 Plentiful available inventory in the major adult-use markets is likely suppressing wholesale rates even as 4/20 approaches. Additionally, the ramp-up in production that has been occurring in Nevada since prior to adult-use sales opening in mid-2017 appears to have resulted in supply outpacing demand in the Silver State, which is currently seeing the most pronounced downward trend in wholesale prices of any sizeable legal cannabis market in the country. 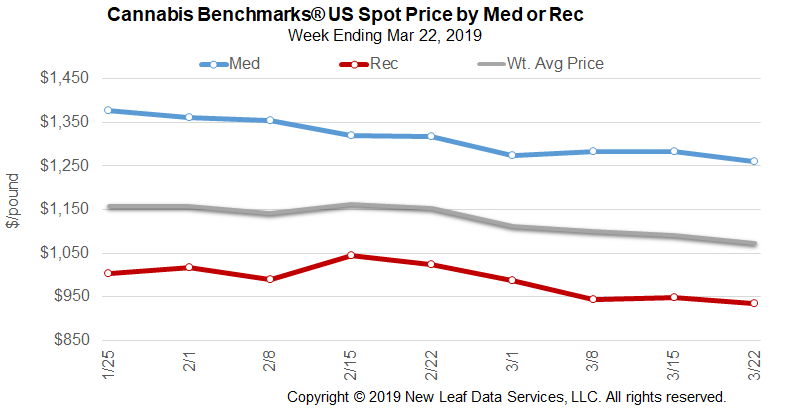 The national volume-weighted price for flower to be sold in adult-use markets declined this week on significant downturns in Oregon and Nevada, as well as a decline in Washington, which overwhelmed increases in California and Colorado. Falling prices for medical product in Arizona, Massachusetts, Michigan, and New Mexico, among other markets, pulled down the national rate for flower to be sold to patients. April 2019 Forward unchanged at $1,075 per pound. The average reported forward deal size was unchanged at 46 pounds. The proportion of forward deals for outdoor, greenhouse, and indoor-grown flower was 58%, 29%, and 13% of forward arrangements, respectively. The average forward deal size for monthly delivery for outdoor, greenhouse, and indoor-grown flower was 45 pounds, 48 pounds, and 44 pounds, respectively. At $1,075 per pound, the April Forward is nominally equivalent to the current U.S. Spot Price of $1,074 per pound. The premium or discount for each Forward price, relative to the U.S. Spot Index, is illustrated in the table below.